Turning Responsibility Into Powerful Service (TRIPS) Leader, 2016-2017. For successfully co-leading a group of your peers on an alternative break service experience. You learned more deeply about a social issue as well helped your peers to expand their knowledge of that issue. You have aided the TRIPS program in growing active citizens. 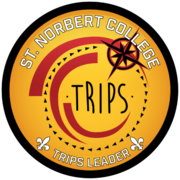 In the St. Norbert College Transformative Experiences project, students are encouraged to map out the St. Norbert experience they hoped to have when they chose to attend SNC. Through the use of digital badges like this one, we hope to note which activities, events, and experiences have meaningfully contributed to that experience during your time here. These badges are organized around themes related to the College's common learning outcomes and are awarded during phases of a college experience we refer to as "Moving In," "Moving Through," and "Moving On," with focuses on, initially, experiences you might simply participate in that are meaningful, followed by experiences that allow you to build your strengths, skills, and competencies, culminating in a fully well-rounded, liberal arts experience. Students who successfully complete a number of these badges have an opportunity to wear a special pin at graduation denoting their SNC career. The TRIPS Leader badge is considered a "Moving Through" badge in the category of Personal Character and Virtue.